ANNECY, FRANCE: Located in the north of French Alps, Annecy is known as “the Venice” of France. Small canals and streams branching out of Lake Annecy dissect and run thru this medieval town in many parts. Its thriving center is magnificently situated among mountains, lake, old quarters, and historic buildings that never fails to captivate its visitors. Surrounded by the majestic Alps, this place is gaining popularity among those who come to visit Mont Blanc…the highest peak of the Alps. 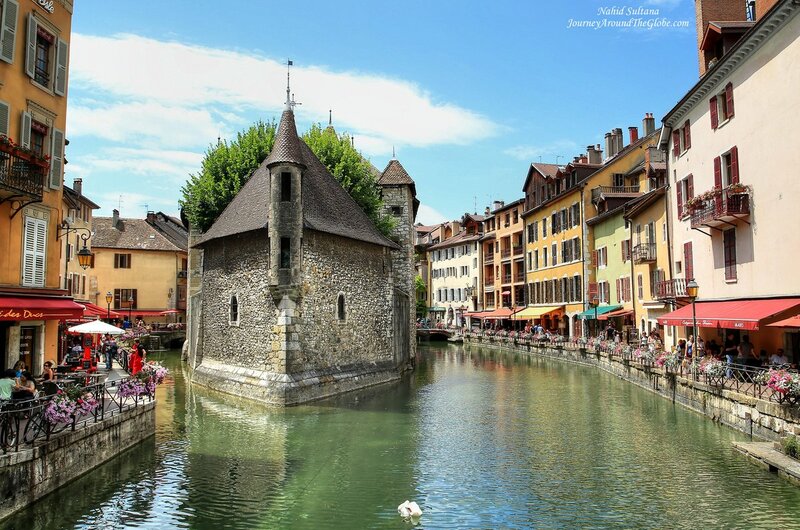 Annecy boasts of having a past which goes back much further than that of most other towns in the French Alps. Romans developed settlement here after the mid-1st century AD but the town gained importance after the destruction of older Annecy-le-Vieux. The city fell under the counts of Geneva when they settled here in 1219. 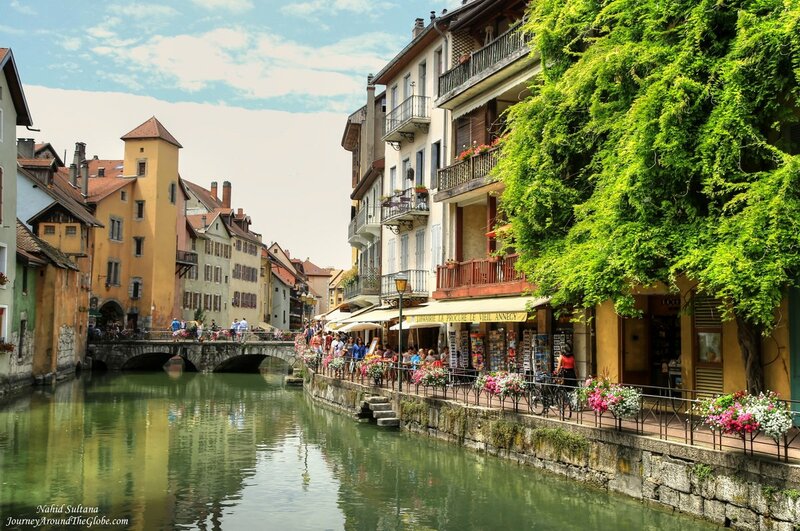 The golden age of Annecy started from the 16th century when River Thiou (which runs through the city) became a motor of artisan development. Its town center was built around a 14th century castle. Other Alpine cities like Geneva or Chamonix are very close. Also check out nearby villages for day-trips…can’t go wrong with them. TIME of TRAVEL: This was our last road trip before leaving Europe for good. Therefore, it’s a memorable trip for our whole family. Our friend Sidfar from Antwerp, Belgium also joined us in this trip. 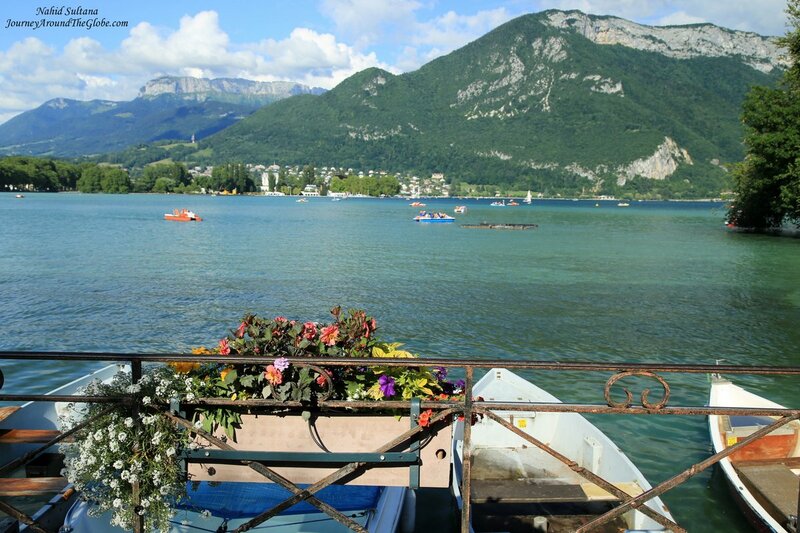 We drove from Tervuren, Belgium to our hotel in Annecy on a nice Friday of July 2014. It was a scenic 5/6 hours of drive. OUR HOTEL: Our hotel was not really in Annecy but in Cran Gevrier. It was “Sejours & Affaires Pont Neuf – Cran Gevrier”. The hotel doesn’t have 24-hour reception service. That was not a problem although we reached there really late at night (they left the keys in a safe-box for us). Good part of this place that we had a small kitchen and a balcony. We also had free Wi-Fi and parking. All the main attractions of Annecy was within walking distance, may be a bit long walk…but it’s doable. EATING and SHOPPING: There are countless eateries in the old town, may be some of the best ones with some nice view would be by the canals. Many ice-cream parlors, cafes, restaurants of all sorts, and bars make Annecy’s old town a bustling city among the locals and tourists. As for souvenirs, there were plenty of those too. I can’t think of anything particular to buy from here…may be some uniquely shaped beer-glass or Dijon mustard. But t-shirts, key-rings, magnets, post-cards, and other nice trinkets are everywhere. PLACES WE’VE VISITED: We spent a whole day in the old town of Annecy visiting the following sites. While walking we came across lots of historic buildings and monuments left and right. Unlike us, if you have extra days definitely do check out places like Notre-Dame-de-Liesse Church with its 16th century bell tower, former Hotel de Ville, St. Maurice Dominican Church from the 15th century, and surrounding natural beauty. 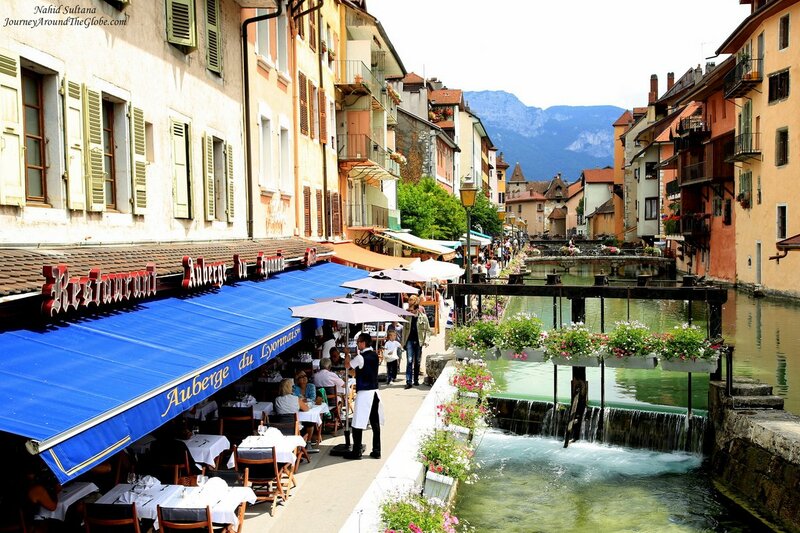 1) OLD TOWN: This is the main spot to spend time in Annecy and be blown away by its beauty. All the tourist attractions are located here within walking distance from one another. One of the prettiest parts of Annecy is looking at River Thiou running thru the old city. This is one of the shortest rivers in France (only 5 km). Make sure to visit Pont des Amours (Lovers’ Bridge) on Vasse Canal. Electric sluice gates near St. Francois Church control the flow and regulate the level from Annecy Lake. The best picturesque view of the old town can be enjoyed near Palais de I’Ile. Once a prison, the fortified house of Palais de I’Ile resembles a stone boat anchored in the Thiou. 2) PALAIS de I’LLE: Our first stop in Old Town Annecy was Palais de L’Ile. Also known as “The Island Palace”, it was described as a “house in the shape of a galley” in a 17th century manuscript. It was built on a natural rocky island between the canals and is classified as a historical monument of heritage from the Middle Ages. This fortified house was first mentioned in 1325 (the oldest part dating back to the 12th century) and conserved its main function as a prison until 1864. Its current shape of the bow of a ship was doubtlessly built in the 15th Before the palace became a courthouse and prison, it was a coin minting workshop during the 14th century. Walking through the interior of the building, you can discover the history of the Palace on the island and the area around Annecy. Photographs in this museum displays different era of Annecy and surrounding region, mostly in France. Ticket is 3.70 euros per adult for the ticket. We were done in less than an hour. 3) FRANCIS CHURCH: Also called Eglise St. Francois de Sales, was our next stop. It’s a fabulous view and atmosphere as we were walking from the prison to this church. Standing on a bridge (wooden, I think) you get some unparalleled views of Annecy’s old town. Current look of this church is from 1642. 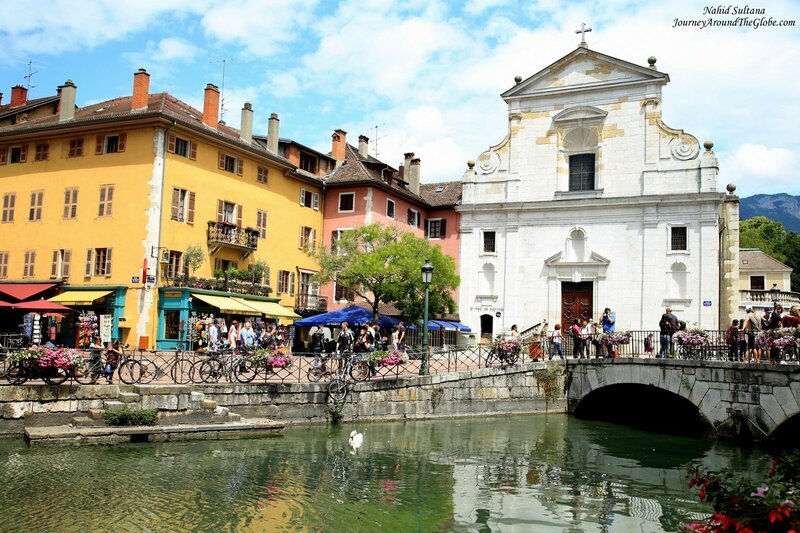 In 1923 the church was given to the Italian community of Annecy. It’s free to go in, so don’t miss out visiting a beautiful historic church. 4) QUAI de BAYREAUTH: We crossed a street, walked further down towards Lake Annecy, and there we were standing in Quai de Bayreauth…a magnificent promenade by the lake. Walking alongside the water, looking at the distant mountains, colorful houses, and small communities by the lake were breathtaking. I could spend hours just by sitting there looking at nature and people who were enjoying it. 5) ANNECY CHATEAU: It was one hot summer day when we visited Annecy. From Quai de Bayreauth we had to take a break in an ice-cream shop before starting our ascent towards Annecy Castle. 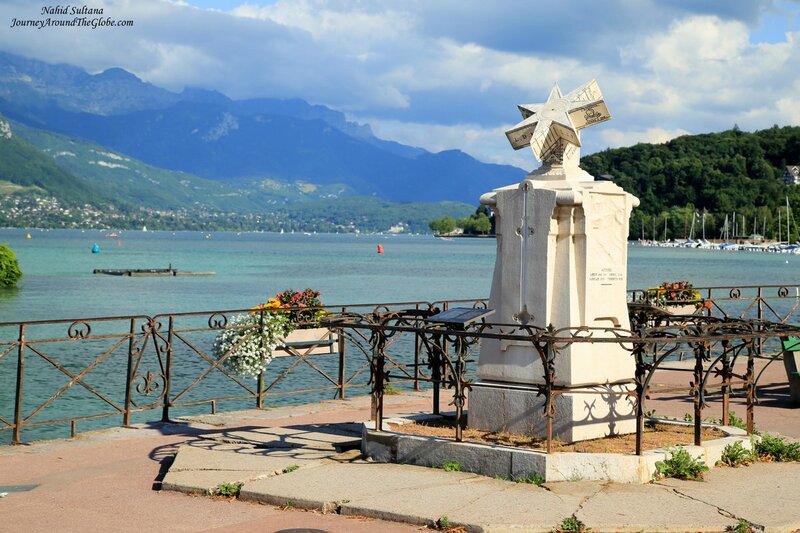 This is a historic landmark of the town and a great place to get some panoramic view of Annecy because of its elevated position. The castle ground is not that big and is leisurely doable in couple hours even if you visit every exhibition and read every information board. Standing at one edge of this castle, we got to enjoy a 360 degree view of Annecy, the lake, mountains, and many church steeples. 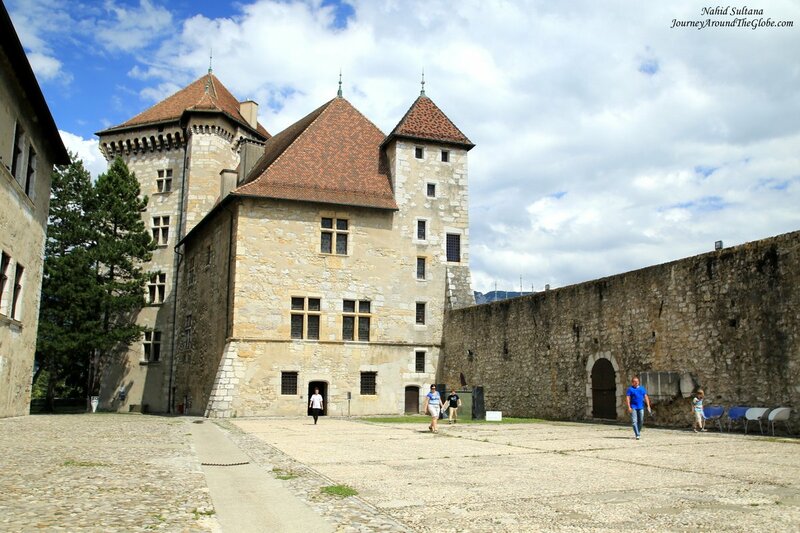 Classified as a Historical Monument in 1902, Annecy Castle was the residence of the Counts of Geneva in the 13th and 14th centuries. The castle expanded over the next two centuries and gave its current look. Towers were added in the 12th and 14th centuries to strengthen the defensive system. Abandoned as a residence in the 17th century, it was used as military barracks until 1947 and later in 1950s it became a museum. Ticket is 5.10 euros per person. The castle is up on a small hill and I was a bit tired getting up there on foot (seriously, I was tired from my 10 minutes of hike…bleh). 6) BASILIQUE de la VISITATION: Coming to this basilica was another long walk thru steep and winding paths and climbing many stairs. From the castle, we then walked along Avenue de la Visitation to come to the imposing convent and basilica of the Visitation tower. Built from 1909 onwards, The Visitation Basilica has been the home to Visitation nuns since 1911. The church was finally finished in the 1930s in Neo-Romanesque style. Inside, stained glass windows illustrate the lives of Francis of Sales and Jane of Chantal. Both were laid to rest in gilt copper sarcophaguses. The esplanade provides lovely views from the top. 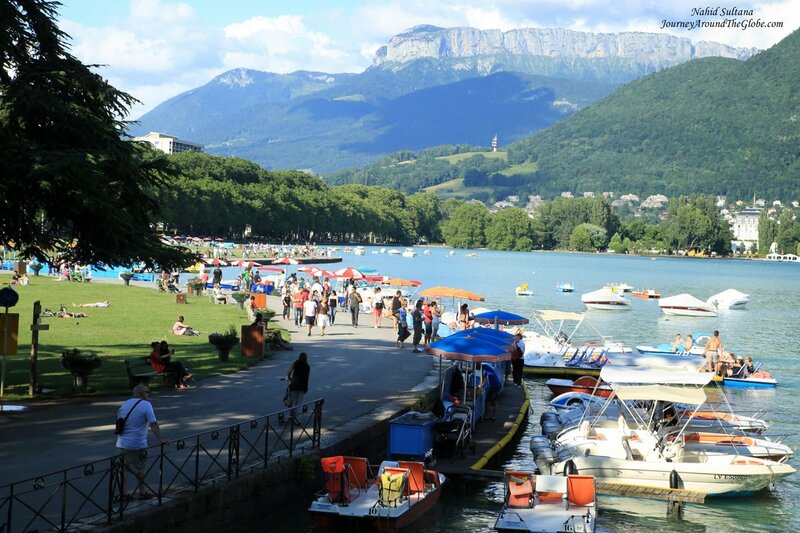 From here, you can appreciate the beautiful region of Annecy and its development. Inside the basilica is simple but has an elegant altar. 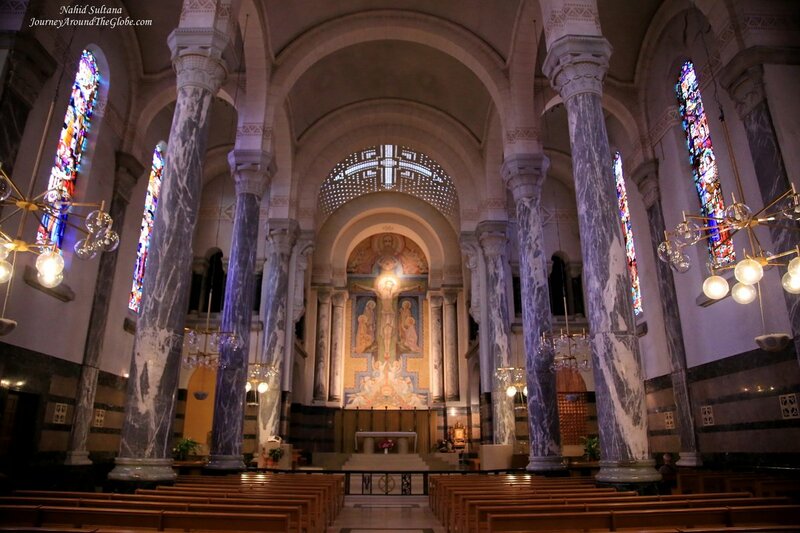 Giant marble columns and exquisite stained-glass windows are definitely something to appreciate here. 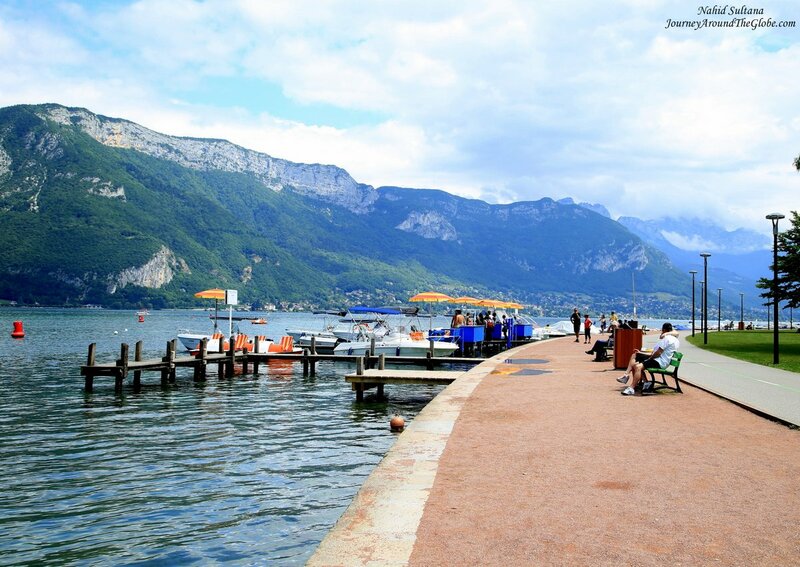 7) QUAI NAPOLEON III: Parallel to Quai de Bayreauth, this is another promenade by Lake Annecy. We sat down in the park with statues, fountains, benches, and of course breathtaking views of the Alps. My girls were tired…so it was a perfect place to chill and enjoy the surroundings. The small artificial island in the lake (Ile des Cygnes) looks beautiful with the French Alps in the backdrop. We sat down on the grass for a while. People were padding and canoeing on the blue water while some were enjoying live music in the park (and dancing too). On the edge of the quay a sundial stands from 1822. We walked by the relaxed and beautiful promenade of Les Jardins de l’Europe, crossed Pont des Amours (where you can see love-locks hanging on the bridge railings), and strolled by Promenade Jacquet. Jardins de L’Europe is more like a children’ play area, a landscaped garden planted in 1863. Pont des Amours displays the iron architecture of the early 20th century. It crosses the Vasse canal which gently flows under a romantic vault of planes trees in the direction of a merry-go-round dating from the 1906. It was a late afternoon…the sun was soft. I couldn’t imagine being somewhere else other than here. Eveything is said. Happy you ejnoy our lovely town. What a great place to visit with the Alps always in the background. An added plus was being somewhere that had roots in the 1st century. Wow! Fabulous.. what a wonderful trip you have had! Indeed Peter, a fantastic place to relax.